There are so many times when just a touch of extra lube is needed. Super Slick is an ideal product to have on hand for any of those occasions. 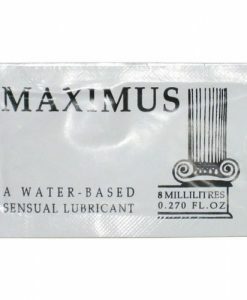 Because it is water-based it is safe to use with condoms. As an extra internal lube during and after menopause, it provides an almost natural effect. Super Slick is non-greasy, non-sticky and washes clean with soap and water. This pump dispenser will last a very long time because just a few drops go a long way. Customers have been using this same product for years and always return for more. Orders received before 3pm (Monday-Friday) are processed on the same day – after 3pm orders will be processed on the next working day. This even includes part packs of condoms. For example, if you buy a pack of 10 condoms and try 1. You decide that you don’t really like those condoms so you return the other 9 (unused) condoms for a full refund. At AllCondom, if you’re not happy, we’re not happy. It really is that simple!